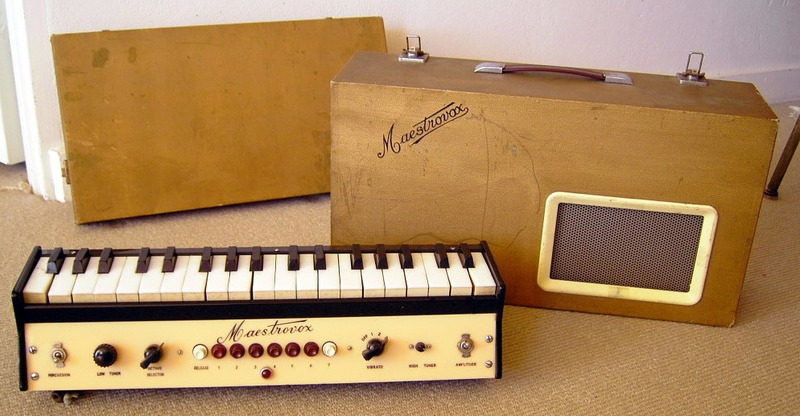 The Maestrovox was a monophonic portable vacuum tube organ built by Maestrovox Electronic Organs in Middlesex, UK. The instrument was one of the many designs similar to the Clavioline, Tuttivox and Univox and intended as a piano attachment instrument for dance bands and light orchestras of the day. The Maestrovox was produced from 1952 onwards and came in a number of models, the Consort, Consort De-Luxe, Coronation and a later version that mechanically triggered notes from a Piano keyboard, the Orchestrain. I used a Maestrovox keyboard with This Heat, set up just to the left of my drum kit (alongside a Bontempi electronic organ with about 3 sounds). It can be heard throughout This Heat’s recordings and was used onstage for most of the group’s gigs. 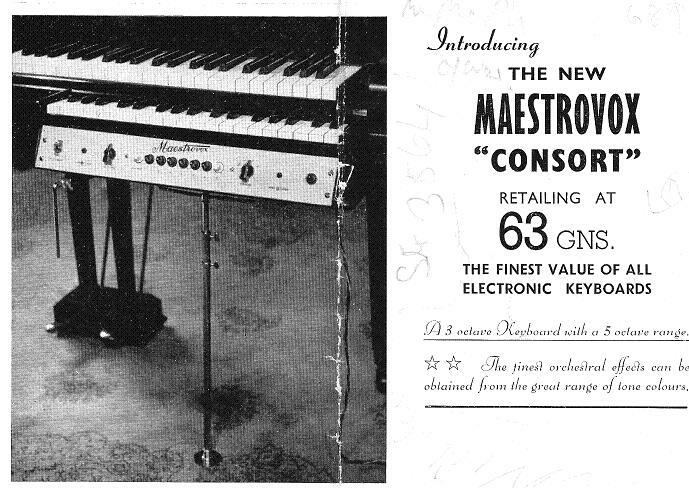 The Maestrovox was a fascinating instrument, it was advertised second-hand in the Evening News small-ads, maybe 1966 or 68, I didn’t really know what it was that I was going to see, just that I wanted to use an electronic keyboard in conjunction with domestic tape machines and this was going fairly cheap, £15 or so. I persuaded my brother to go half although in truth he never really used it. When we got it back home the unusual qualities of the instrument slowly became clear. Firstly it was monophonic, with priority given to the highest note played; this was heavenly, you could ‘yodel’ between notes, sometimes using the lower note as a drone, sometimes playing contrary lines in 2 hands with only 1 note being heard at any time, sort of ‘strobing’ between 2 places. The keys were highly sprung, so that on the black notes, if played very quickly, the springs would activate even faster and the rate of change between the higher played note and a sustained lower sound would be very distinctive. This sound was used at the beginning and end of the 1st This Heat album and also played very quietly for about 20 minutes immediately before a gig, a bit like a distant alarm. Tuning was an unsolvable problem that became a fantastic strength and the predominant reason for using the keyboard with the group. There were a couple of little tuning knobs on the console of filters that were changed with a screwdriver. No matter how I tried I could not find the place where the keyboard was in tune with itself, the nearest I could get was the low D to have its octave on the E 9 notes higher, in other words a 14 note octave (instead of the usual 12). Consequently every note was slightly flat or sharp. This meant that melodies had to be re-learnt when using the Maestrovox so that the tuning would bend in and out with other ‘orthodox’ tuned instruments. When played at the ‘back’ of the group’s sound the result would be to inexplicably ‘widen’ the sound. The 4-step vibrato didn’t seem to work properly and had the effect of flattening the tuning by very small amounts, a little more than a quarter tone at the fullest extent. A series of filters changed the sound, 5 or 6 little buttons that could be engaged in different permutations. A 2- page pamphlet had a list of filter combinations that imitated ‘real’ instruments (always a doomed idea). I seem to remember that 13 was bassoon in the lower register (a particular favourite) and oboe in the higher register. These sound filters also effected the tuning. Another row of 3 buttons changed the attack parameters, without a little ‘slope’ it was kind of ‘clicky’, like the sound was being switched on. The keyboard was about the size of a PSS Yamaha (which is sometimes confusingly described as a ’midi’ keyboard), and had a range of perhaps 3 octaves. The Maestrovox was designed to sit under a piano keyboard as a sort of addition to the acoustic instrument, although the tuning must have made any orthodox use hilarious. There was a sort of tripod that was supposed to hold it up against the underneath of the piano keyboard, this looked very shaky and unreliable, so my dad knocked up a stand, something like a shrunken Hammond. Valves glowed inside the keyboard which was connected via a multi-pin plug and lead to an amplifier that also served as a box for transportation. Both mains electricity and sound signal were conveyed by this lead. To boost the signal I connected a pair of crocodile clips to the speaker and this was then plugged in to a larger amplifier. I’m not sure if a connection socket was fixed for ease and reliability when This Heat started touring more regularly. The volume was controlled by a knee-operated lever (I remember harmoniums used this method too), I found a way of holding this in place and used a foot swell pedal instead. It blew up sometime before This Heat began and it was quite a problem getting replacement valves. During the recording of ‘Cenotaph’ on the Deceit album it blew up again, in fact the track starts out with 2 tracks of Maestrovox and by the end there’s only 1 because it stopped working during the overdub. Getting replacement parts was time consuming, perhaps impossible, and then other things meant that a lot of equipment held in our rehearsal studio Cold Storage got lost, including the Maestrovox. By this time This Heat had split and it’s sound was so much part of that group that I was both sad and pleased to see it go.